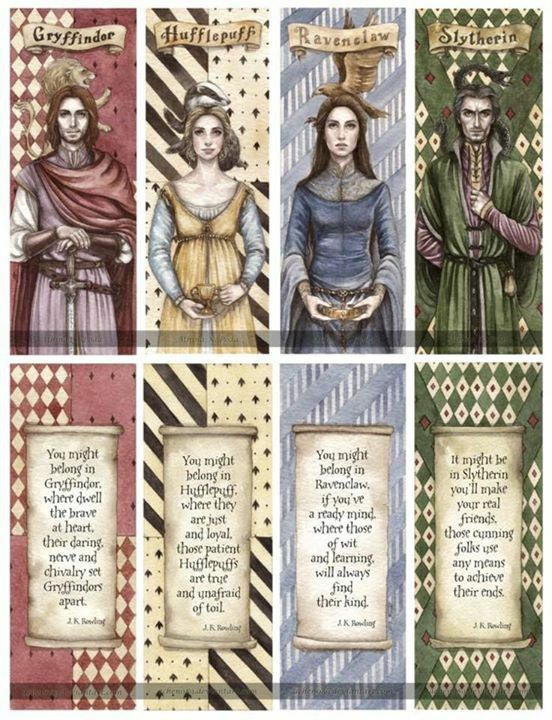 Godric Gryffindor, Salazar Slytherin, Helga Hufflepuff and Rowena Ravenclaw. These four established the British school for wizards in the 10th century. Godric Gryffindor was described as a fair man. Thinking that any child who showed magical abilities should be able to attend Hogwarts after their 11th birthday. He valued courage and bravery. His house corresponds with the fire element as well as the sword of Gryffindor. He was apparently the best friend of Salazar (before he left the school) and was the original owner of the magical sorting hat. Helga Hufflepuff is described as kind and warm. The values attributed to her house are loyalty, patience, and hard work. Her house corresponds with the earth element, as well as a “fine golden cup”. She was best friends with Rowena, and is attributed with bringing house elves to Hogwarts. Rowena Ravenclaw is described as sharp and intelligent. Thus, intelligence is attributed to the Ravenclaw house. The house connected to the air element, as well as a diadem which was stolen by Rowena’s daughter Helena. She wanted to make Hogwarts the best Wizarding School on earth by teaching only those with the highest intelligence. Salazar Slytherin is described as sly and cunning. He was a strong supporter of pure bloods, thinking that only those with pure magical blood should be allowed to study magic. He eventually left the school. His house corresponds with the water element, a family locket, and the chamber of secrets which he created under the school. I think I belong in Ravenclaw. I think you would too! Go to pottermore and find out! I can’t do it without an account, huh? I will set that up sometime and see what happens…! EEEP! sorry the picture didn’t come up in my notification bar! WOOHOO! It’s always fun to return to Hogwarts 🙂 Happy A-to-Z-ing. 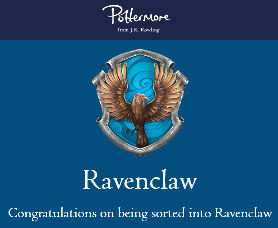 I’m a Ravenclaw through and through. I was so anxious when I was sorted on Pottermore that I might end up in the ‘wrong’ house, hehe. Every quiz I take puts me in Ravenclaw. I had my BF take a quiz and he was Gryffindor. I have two house flags hanging up in our geek den. Haha I live in that dark corner. Every time someone tells me about a show or a book series I’m like do I have room for another Fandom? People sometimes call me Luna. It might be an insult in their perspective but I personally think that girls got skills and an exceptional brain and quirk. Luna is my patronus really. Wooot! Most people think the worst fate is to end up in Slytherin – I think the worst fate would be Hufflepuff!